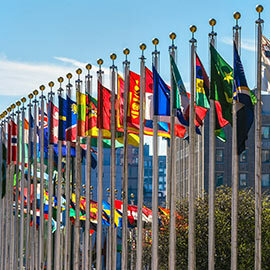 Graduate students in Wilfrid Laurier University’s Master of International Public Policy (MIPP) and Global Governance PhD programs have contributed to the Balsillie School of International Affairs’ new anthology on Canadian foreign policy in a changing world. Turbulent Present, Uncertain Future is the final output of the 2015/16 CIGI Graduate Fellows program, a professional development program run by the Balsillie School of International Affairs (BSIA) in partnership with the Centre for International Governance Innovation (CIGI), Canada’s leading international affairs think tank. The anthology contains policy briefs prepared for officials at Global Affairs Canada (GAC). Through the CIGI Graduate Fellows program, Laurier MIPP and Global Governance PhD students based at the BSIA engaged directly with top items on Canada’s policy agenda, including: climate change, migration and displacement, arctic governance, trade with emerging economies, and humanitarian engagement. Laurier graduate students in the program were also able to gain mentorship and guidance from senior scholars based at CIGI and the BSIA, including Laurier professors Simon Dalby, Margaret Walton-Roberts, Robert McLeman, James Orbinski, Alan Whiteside, Audra Mitchell, Jenna Hennebry, and Jonathan Crush. The graduate students developed innovative policy solutions based on sound, empirical research and incisive analysis. Their research was then presented this past summer to senior officials at Global Affairs Canada in Ottawa. The BSIA’s full news release is available online.